If you are ever reminiscent of France and in the mood for a beautifully buttery croissant, you need not travel any further than West Hollywood. But not just anywhere in WeHo. Forget the scene and oversized, mediocre plates at The Griddle and walk two blocks toward Luca. At the cross-streets of Laurel and Sunset Boulevard lies the eatery that prepares some of the best pastries in the LA area. Only organic ingredients are used in all of their recipes, including organic flour in the construction of these beautifully baked goods – so you know that you’re only getting wholesome goodness. The croissant is probably the best I’ve ever had. It comes out warm and embodies the perfect balance of flakiness, butteryness and finally, that pull-apart lusciousness in the center. The apple tart? To die for. The currant scone? A beautifully moist texture (despite the scone not having butter in its recipe). The blueberry muffin was super fresh. 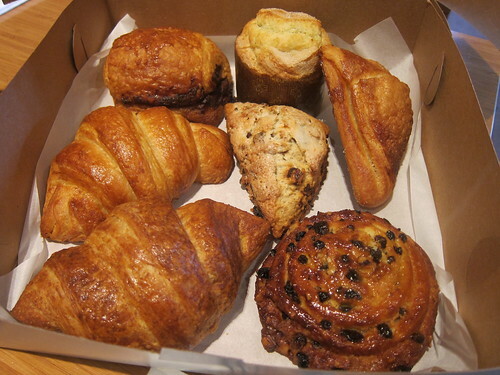 Clearly, no corners are cut at Luca – and this, I can tell from just the pastries. This entry was posted in Brunch, West Hollywood and tagged breakfast, brunch, croissant, Luca, Luca on Sunset, pastries, sunset blvd, West Hollywood. Bookmark the permalink.